Price: $49 per issue or $99 for a one year subscription. Have you ever watched as someone else worked? Watched their technique and work flow? It can be quite amazing how others use the same software we use. Some people have very different techniques they have developed to solve certain problems, and often we can learn some new helpful tip just by watching how others work. As members of the Los Angeles Final Cut Pro Users Group, many of you attend the meetings for this purpose. We read books, and we watch video-based lessons but everyone can agree that we still like to go to meetings to watch and learn from others. We are constantly looking for that one more tip that will improve our use of software and give us that little extra something we know is out there. I am constantly growing, and just when I am foolish enough to believe I have taken something as far as I can, someone shows me something that opens the door ever so wider, and I find that I really don't know near what I thought I did. This becomes the fuel that keeps me coming back for more. As I read these same people in the forums, and I watch the experts speak and solve problems, I know I can count on a never-ending supply of unique and helpful ideas. More than just learning new techniques about existing software, we go to meetings for another reason. We like to see vendors show off their new products and explain how they work and what they offer. We love this industry and we love to read about all that encompasses its perimeter. Naturally when I heard about a DVD-based magazine that does all of these things I was very interested in seeing this for myself. 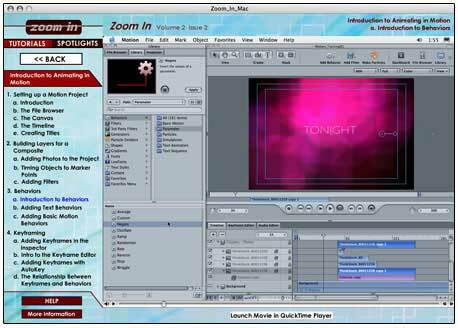 Enter Magnet Media's Zoom In DVD-based magazine. These are the same folks that continue to bring us learning tools that cover all the latest applications we use every day, and this costs under $99. I have been their customer since their Final Cut Pro 2 training CDs, and if you're like me, you already own a few of their trainers and likely have another on order even now. So What Is Zoom In, Exactly? Zoom In is a way of bringing industry expert interviews and tutorials to an audience much more quickly than was possible before. Let me explain what I mean by that. Because the magazine is shipped quarterly, the folks at Zoom In have the ability to bring us interviews and information from industry experts as the information is still fresh. In this current issue for example, Zoom In offers over an hour of video-based training for Apple's new Motion application. They are able to publish this long before the actual DVD training series is released because there is no need to wait for the hours of training sessions Magnet Media will offer later to wrap up. The idea is to give the audience a head start with smaller versions of a diverse array of useful tutorials and interviews. This is a review of that magazine and as such I'd like to talk about the current shipping edition: Volume 2, Issue 2. To get you familiar with the product, please allow me to show it off a bit. The magazine has two main sections, which are "Tutorials" and "Spotlights". Each issue offers a multitude of tutorials and many interviews. The current issue's Spotlights are focused on High-Def, taken from the floor at the National Association of Broadcasters (NAB) event in Las Vegas. The Tutorials feature hours of instruction on Apple's new Motion and DVD Studio Pro 3 applications, Adobe's Photoshop CS and After Effects, and a special course on the fundamentals of High-Def by Evan Schechtman. "Come for the tutorials, stay for the show!" 1. Animating in 2D in a 3D Environment in After Effects. 2. Building Custom Alpha-Transitions in DVD Studio Pro 3. 3. High Definition Video Fundamentals. 4. Masking Techniques in Photoshop CS. 5. Introduction to Animating in Motion. The tutorials are incredibly generous. The Adobe After Effects and Apple Motion training sections are each over one hour in length. 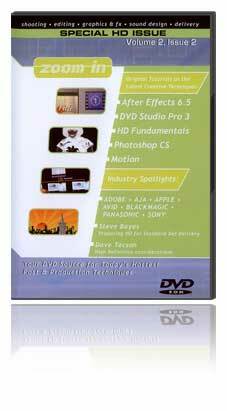 The Apple DVD Studio Pro and Adobe Photoshop CS tutorials are each over half an hour in length. Lastly the High-Def fundamentals tutorial is approximately eighteen minutes. That's over three hours of up-to-date training on the latest applications. Just to give you an idea of the strength of the topics covered in these smaller tutorials let's review two of them. Marco Solorio shows you how to take a 2-dimensional Illustrator file and animate it in 3D using After Effects' 3D tools. He'll also teach you a cool AE expression for animating based on the amplitude of audio. The interface of Zoom In is a huge improvement from the earlier versions of the DVD magazine. Magnet Media has now modeled the product after the well-designed tutorials they sell. Marco's tutorial is just like larger tutorials in that it has its own Introduction and Conclusion. The topics he covers will teach you some of the most wanted functions of After Effects, including using 2D illustrations in the After Effects 3D space. Working with After Effects Expressions is an often overlooked subject that Marco tackles for you here. The tutorial is actually quite fun. It's short enough that you can work through it easily and informative enough to keep you interested. These tutorials, like their much larger cousins, come with project files so that you can follow along with the tutorials for a truly hands-on lesson. Just look at the main topics and the lesson breakdown below. You can see that these lessons are truly the younger cousins of the multi-hour sessions Magnet Media currently offers, but because they are smaller, you get them more quickly than waiting for the full-blown products to ship. Next let's take a look at Apple's Motion application through the eyes of Megan Cunningham. By now you most certainly have heard of Apple's hot new Motion application. Megan Cunningham is Magnet Media's very own founder. Megan gives us an introduction to animation with Apple's Motion. While everyone readies their Motion training books and videos, you can get started right now with Megan's one-hour session. Megan's presentation is excellent, and as you can see from the topics listed below, the lessons learned here are more than adequate to provide you with the knowledge you need to start using Motion right away. As with the After Effects tutorials, the project files that are needed to follow Megan's every instruction are included. Though I have completed the tutorials provided by Apple and read through 300-plus pages of the manual, I still found I missed a few spots. The best part is that the lessons are fast. They keep you watching, teaching you what you need to know and leave out the fluff. In the first fifteen minutes you are creating titles and will soon be compositing, coloring, and working with behaviors and keyframes. There are three more tutorials, but I am going to skip over those. I think you get the idea what these tutorials are about. The other half of this DVD magazine contains the industry spotlights. Spotlights are interviews with industry leaders. In the first edition of Zoom In for example, those interviewed included Alton Christensen, Vice President of EdgeWorks; Craig McKay, the Academy Award-winning Editor for The Silence of the Lambs; and Everett Moore, Sound Editor at Skywalker Sound. In this latest edition the Spotlights come from the floor at this years' National Association of Broadcasters (NAB). If you were lucky enough to attend this years' NAB then you know that this was a fantastic year to be there. Apple's Motion application was standing room only from the start of the morning show on until the final show at the end of the day. All of your favorite companies, including Apple, Adobe, AJA, Avid, Blackmagic, and more were showing off the latest releases of their software and new low-priced High-Def hardware, and the folks at Zoom In Magazine were there to bring all the excitement of software, High-Def, and more back to all who couldn't attend this years' events. That's the focus of this issue's Spotlights. These are the companies and well-known industry professionals, in highly polished interviews from right on the NAB floor. What do I mean by polished? Well, for example, as I watch Steve Bayes, the product designer for Avid's Media Composer, Symphony, and the DS Nitris, now turned consultant, describing the HD work flow issues between shooting 16:9 and finishing 4:3, the Zoom In editors have thoughtfully added the visuals into the interview to help express Steve's description of the issues we face. 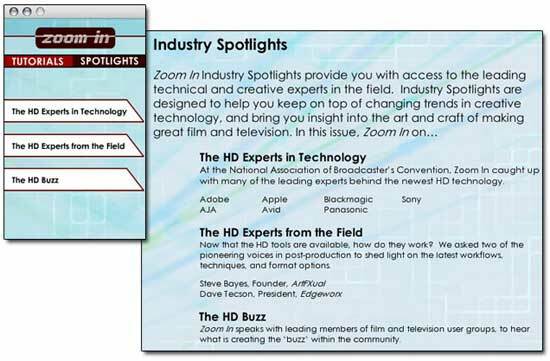 Now this is a High-Def focused issue of Zoom In, so each of these interviewees is showing off their latest HD solutions. You'll hear about the Kona 2 card directly from Ted Schilowitz, Product Manager of AJA as he explores High-Def with the AJA Kona 2, Apple, Panasonic, and Sony. As you watch these interviews you will see that these are not your typical "point a camera at a company executive and ask questions" in the reporter style interview of passing microphones back and forth. Though these interviews are conducted on the showroom floor, they are much more professional than that. The footage is edited well with scenes taken from all over the NAB floor so you get a focused interview with all the quality of a television show. Zoom In managed to eliminate almost all of the background noise on the showroom floor. The voices you hear are extremely clear. There are plenty of faces you'll recognize, from Philip Hodgetts of Intelligent Assistance, Inc., and frequent LAFCPUG Stump the Gurus guest, to Kevin Monahan, aurthor of one of my favorite Final Cut Pro books: Motion Graphics and Effects in Final Cut Pro. You'll see the founder and C.E.O. of Blackmagic, Grant Petty, showing off Blackmagic's HD solutions, as well as watch industry expert Dave Tecson of EdgeWorks as he gives his insights on High-Def production. I did attend this year's show in Las Vegas, and though I was there for two days, I still found myself smiling again as I watched these interviews. The excitement is still there. If you missed all the fuss of High-Def at NAB, this is the must-have Zoom In edition for you. I hope that gives you a clear picture of what this great magazine is all about: A lot of excellent tutorials, and insightful Spotlights with the industry leaders and experts, wrapped up nicely in a quarterly released video-based magazine. One of the biggest benefits of the tutorials provided in this magazine is their timeliness. As software updates and new applications are launched, there is a period of time in which we have the application with very few third-party instructional aids. Many people have not made the leap to Motion just yet. Perhaps there are questions yet to be answered. How does Motion work exactly? What are these behaviors that everyone is talking about? How do we animate without the use of keyframes? There are so many questions, and with so little information currently out there, it's hard to know where to find the answers. Watching an hour of video-based lessons goes a very long way toward answering all your questions. You see the application in use building a project. You see how it works, and witness the kind of work it is used for. Who knows, this may be exactly what you are looking for. This actually describes a real situation I found myself in just about the time the first issue of Zoom In was released. 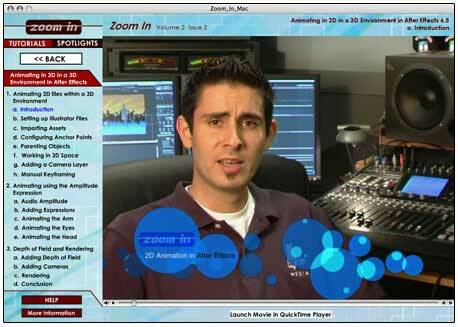 At that time, Zoom In featured a tutorial on using Cinema 4D with Final Cut Pro to create a 3-dimensional lower-third. That tutorial prompted me to pick up the telephone and purchase Maxon's Cinema 4D. If you read the forum posts, you'll see I show it off from time to time as well. I have been using it ever since and I couldn't be more thrilled with the application. I had modest needs for 3D at the time, and Maxon allows you to buy in modules. So rather than over-purchase more than I needed with LightWave 3D or Maya, I spent much less money buying just the basic edition of Cinema 4D, and I have not out-grown it yet. These interviews do exactly the same kinds of things. You may have heard a description of a product already, but watching the industry insider explain gives you a second look at a product through the eyes of the developers and the professionals that use these tools in Spotlights in a great way to get acquainted with all that is out there. They may have something to show or say that will prove to be quite beneficial and could take you in a completely new direction. At $99 a year for a full subscription, that's just $25 for each DVD. This edition of Zoom In has five expertly taught lessons on a wide assortment of the popular applications we all use today. That's just $5 a lesson, which averages 40 minutes of instruction, and even more than that, you still have the Spotlights interviews with industry leaders included. I'd say that's quite the value.